For some time there are many of you qrv in the lovely operation mode ROS – created and written by our friend Jose Alberto from Spain ! In Germany it devellopped to a fast seller by cb-radio operators in digi-modes.Here we use – accordant to the legal terms – channel 25 USB for ROS and other broadband device digi-modes. Within a few days it was possible to reach radio friends throughout Europe, Israel and even Nicaragua. It was an unbeleavable success ! We´d like to thank all the radio friends for their activity in the past and most of all our friend Jose Alberto for his work. Therefore it was our radio friend Rene who had the idea to install the first world contest in the operation mode ROS. 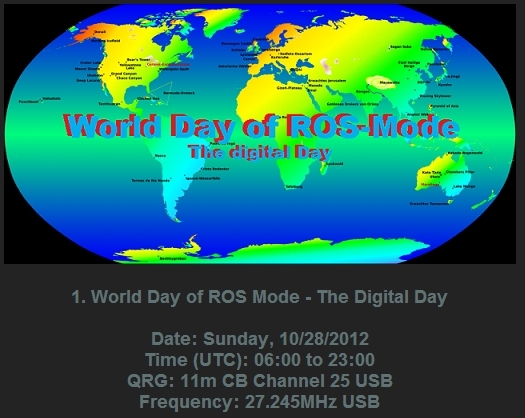 He calls it 1.World Day of ROS Mode and invites everybody to join the contest on 28.october 2012 between 06:00 and 23:00 UTC. The aim is to be active in this time on channel 25 USB and to produce as many contacts as possible. Please inform your friends about this event and be active as numerous as possible during the contest-time. This entry was posted on 22 September, 2012 at 00:55 and is filed under Uncategorized. You can follow any responses to this entry through the RSS 2.0 feed. You can leave a response, or trackback from your own site. Great 1. World Day of ROS Mode! Thanks to all Stations on 11m!! Excelent Day !!!! Thanks to all ROSers ! !